Discussion in 'Guitars in General' started by jzilla, Feb 3, 2012. I got this guitar around 1987 when I was just starting to get serious about guitar. I bought it from my teacher (an old school jazz cat) who was selling it for a friend. It was a long time ago but I seem to recall him saying that it was a Fender copy. I don't think he was right though... I brought it to a couple vintage dealers here in LA and they both believe that it's a real Fender that was refinned. What do you guys think? I'm considering selling it in the near future. What do you think it's worth? definitely seems legit. now my question is, what has this amateur refin done to the value...? maybe not a refin? but then why no fender headstock logo and different inlay?? Why not try Fender? Couldn't hurt. 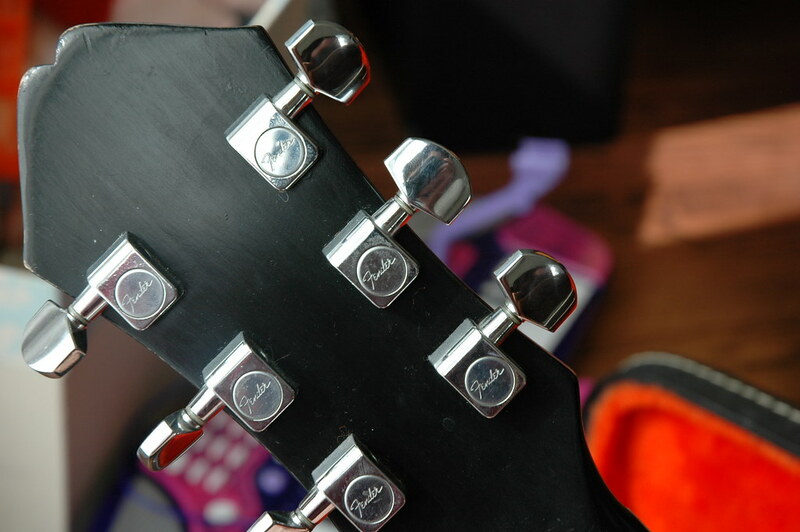 Looks like an Epiphone Tulip headstock to me... weird. I've played a few of these and it looks like a Fender D'Aquisto Standard where someone has routed out the inlay to make their own crappy design. Having owned one and a Fender Flame Elite model, no one would go through the trouble to install the crappy Schaller pickups in a copy. The refinish and the headstock inlay replacement knocked the value down quite a bit. Does it have the OHSC? Yup, pretty sure it's the OHSC. The fellas at the guitar shop believed it to be. They said the weird reddish plush is correct and that the size and shape is very unique to the guitar. I had a blonde one and it was pretty special. Wish I still had it. 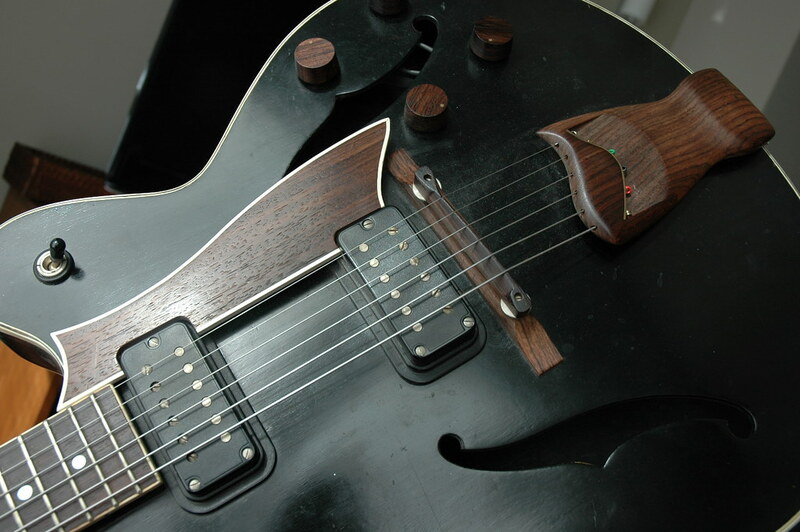 I'get a good natural refinish and ditch that stupid inlay and you'd have a real keeper. These sound really good even with those gainy pups. 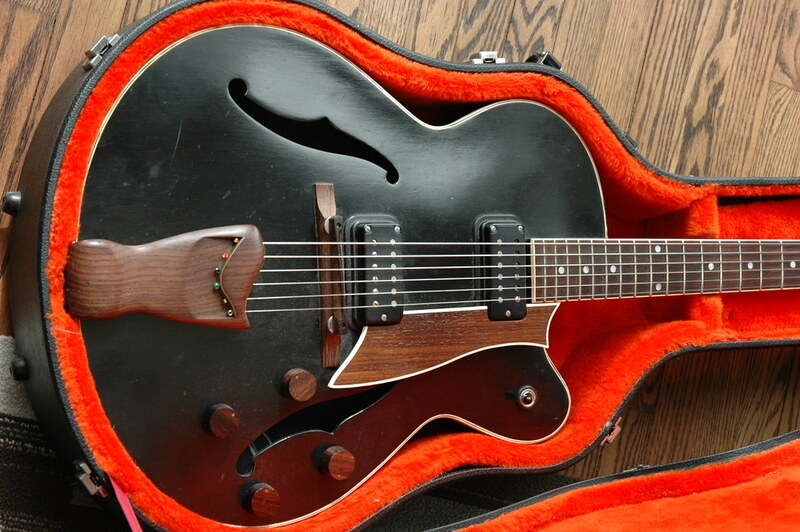 The tailpiece, bridge, knobs and pickguard look exactly like the Jim D'aquisto design, the pickups look exactly like mine. This tells me it's a real body. But that neck? Maybe a Japanese luthier who worked for Fender made one? The finish is not like the original black ones. I love mine, originals go for $2000 now. That one should be worth $1000? Does anyone know a good pickup that will fit in these guitars? Interesting theory about one of the japanese luthiers making it privately... What about the neck besides the finish doesn't look right to you? Seems like if the finish is weird then maybe the refin theory is the most logical? Thanks for chiming in! Just the logo, why would anyone take off the logo? Sorry - my bad. I had a geezer brain fart... You're quite right about the headstock. It was the Flame and Esprit that had the asymmetrical headstock. The D'Aquisto's had the symmetrical stock. crazy story. 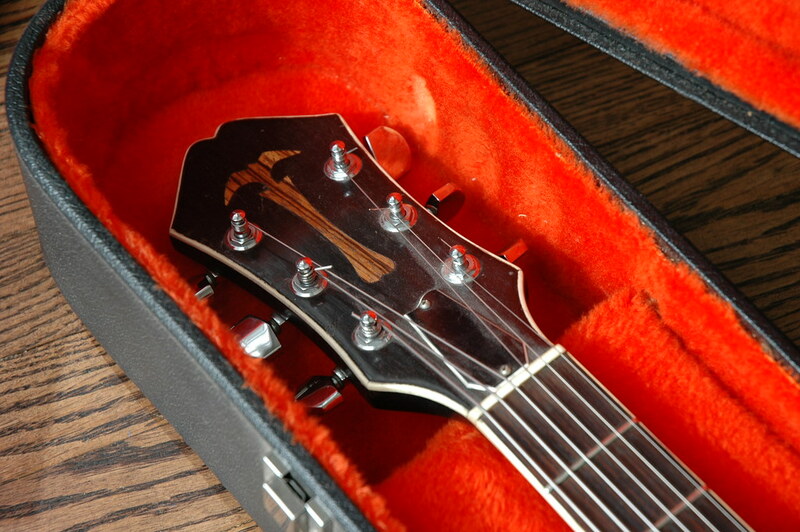 you never know...maybe that thing on the headstock was the logo of the original owner's band...?